A sharp contrast to the capital of Minsk, Brest is a city filled with fortress ruins, old culture, and medieval history. Start off your visit on the 9th (Sun): see the interesting displays at The 5th Fort Museum, brush up on your military savvy at Memorial Complex Brest Hero Fortress, then examine the collection at Brest Railway Museum, then don't miss a visit to Bison on Route Brest - Minsk, and finally examine the collection at War Museum - Territory of the World. Get ready for a full day of sightseeing on the 10th (Mon): see the interesting displays at Saved Artifacts Museum, make a trip to Lights Alley, and then make a trip to Gogolya Street. To find other places to visit, where to stay, maps, and other tourist information, read our Brest vacation builder. In October, plan for daily highs up to 54°F, and evening lows to 41°F. 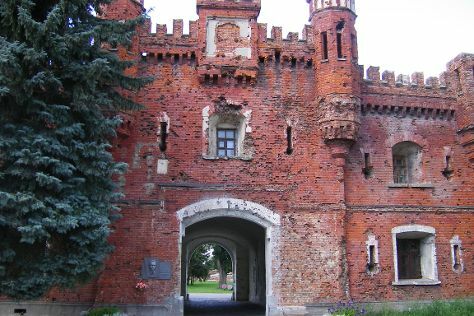 Finish your sightseeing early on the 10th (Mon) so you can drive to Grodno Region. Grodno Region, also known as Hrodna Region, is one of the few large areas in Belarus that was left unaffected by World War II. Start off your visit on the 11th (Tue): take in the architecture and atmosphere at The Fraciscan Monastery and Church, take in the architecture and atmosphere at Kircha / Evangelistic Church, contemplate in the serene atmosphere at Kalozha Church Boris-Gleb Church, then examine the collection at Pharmacy Museum, and finally pause for some serene contemplation at The Jesuit Catholic Church. Get ready for a full day of sightseeing on the 12th (Wed): contemplate in the serene atmosphere at Holy Trinity Church, then take in the spiritual surroundings of St. Nicholas' Church, and then step into the grandiose world of Mir Castle. To find photos, other places to visit, reviews, and tourist information, go to the Grodno Region tour planner. You can drive from Brest to Grodno Region in 3.5 hours. Alternatively, you can take a bus. The time zone difference moving from Moscow Standard Time (MSK) to Eastern European Time (EET) is minus 1 hour. In October, daytime highs in Grodno Region are 50°F, while nighttime lows are 38°F. Wrap up your sightseeing on the 12th (Wed) early enough to drive to Minsk. As the capital and largest city of Belarus, Minsk represents a cultural center full of churches, libraries, museums, and theatres. Satisfy your inner culture vulture at Khatyn Memorial and Belarusian State Museum of the Great Patriotic War. 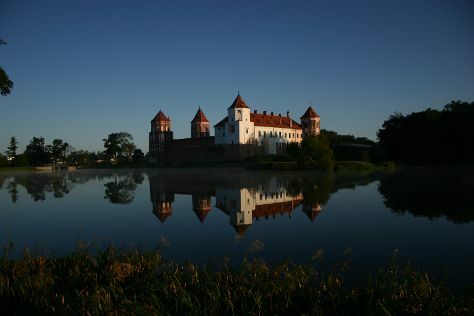 You'll explore and learn at Nesvizh Castle and The National Art Museum of the Republic of Belarus. Change things up with these side-trips from Minsk: Corpus Christi Church in Nesvizh (in Nesvizh) and Dudutki Museum Complex (in Ptich). There's lots more to do: pause for some serene contemplation at Church of Saints Simon and Helena, head outdoors with Trinity Hill, don't miss a visit to Victory Square, and pause for some photo ops at Island of Tears. To see other places to visit, reviews, traveler tips, and tourist information, refer to the Minsk trip builder. Traveling by car from Grodno Region to Minsk takes 2.5 hours. Alternatively, you can drive; or take a bus. The time zone changes from Eastern European Time to Moscow Standard Time, which is usually a 1 hour difference. In October, plan for daily highs up to 49°F, and evening lows to 36°F.